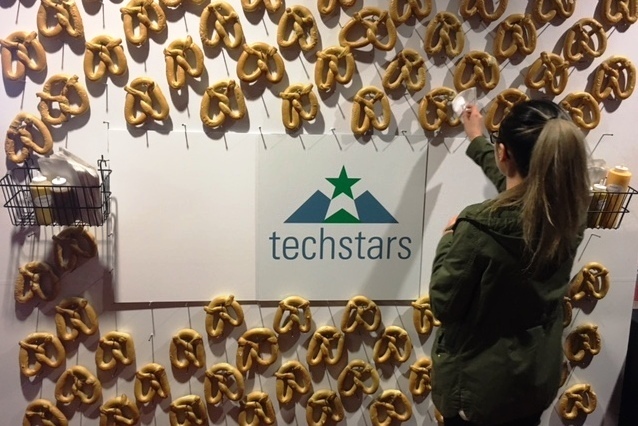 Since opening its doors in Seattle in 2010, Techstars has polished up more than 100 startup companies through its 12-week accelerator program here. Those nascent technology companies have gone on to raise more than $400 million, said Techstars Seattle managing director Chris DeVore, introducing the latest batch of startups Wednesday night at the Museum of History and Industry. The public portion of the program—Demo Day—has morphed over the years from a full-on investor pitch complete with public statements about fundraising progress and goals to what DeVore termed Wednesday a “Demo Day Celebration.” The deal-making has been largely hidden away since regulatory changes limited public solicitation of investments. That’s the legal reality, but it also takes a bit of the crackle out of the live event. That said, one deal was announced Wednesday: Voyager Capital is leading a $1.75 million investment in Portland, OR-based Stackery, with participation from Pipeline Capital Partners, Founders’ Co-op (where DeVore is a partner), and Arlo Ventures, said Voyager partner Diane Fraiman. Stackery, co-founded by Nate Taggart and Chase Douglas last year, makes tools to help software developers take advantage of the shift to “serverless” IT infrastructure. As Taggart told the standing-room-only audience, serverless is the next major revolution in cloud infrastructure. In (overly) simple terms, the management of servers is abstracted away from the developers who write code. One less thing to worry about, and, because companies are only billed for the fractions of a second it takes a server to run its code, there’s a huge potential savings in cloud computing costs. Funding details aside, the other eight companies that presented were interesting, too. They represented a wide range of major technology trends and applications, from the Slack bot built in to Hazel to help managers with areas where they’re struggling to Valid8’s algorithms designed to automate forensic accounting to Coastline Market’s real-time seafood marketplace that would condense the existing supply chain using smartphones and third-party delivery contractors. Other Techstars startups are out to solve problems emerging from technology shifts that have taken hold in recent years, such as software-as-a-service and mobile commerce: VendorHawk is helping companies understand and manage their spending on software that’s increasingly bought on a per-user, subscription basis, outside the control of the IT department. Swym helps e-commerce companies track customers as they engage in disjointed shopping trips across various devices. The latest class also featured two biomedical companies, which have been relatively rare in Techstars Seattle. One of them, Silene Biotech, is banking individuals’ cells for use in drug toxicity screening, regenerative medicine, and other future personalized health applications. Cue Path, meanwhile, is applying sensors to prescription medication blister packs to remind patients to take their meds, and notify their caregivers. Another standout was LevelTen Energy, which is tapping into the growing corporate appetite for renewable energy. Next up for Techstars in Seattle is the accelerator’s Alexa-focused program in partnership with Amazon, beginning in July, and ongoing efforts to attract more women- and minority-led startups to its ranks.